The Lexus LFA was built in a supposed secret workshop somewhere in Japan. Those who assembled the V10-powered supercar were hand selected for their craftsmanship abilities. A deep passion for cars and perfection was also required. But after the last LFA rolled off the production line in December 2012, LFA Works was tasked with building carbon-fiber rooftops and even $10,000 carbon fiber bicycles. And now Toyota has converted the facility to build yet another unique product, the Mirai hydrogen fuel cell sedan. This was a smart decision on Toyota’s part simply because this so-called backlot assembly plant in Toyota City specializes in hand-built production and ultra-efficiency. 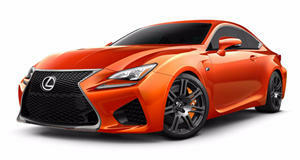 And like the LFA, the Mirai will be very limited. Just 700 examples are planned for the first year and Toyota is already warning of delivery delays. There are already 200 orders for the car. "Each unit is carefully built with utmost care. So therefore, the production volume might be limited," stated Masamoto Maekawa, Toyota’s executive vice president for domestic sale. If Mirai production were to one day increase to 2,000 units per year, this so-called jewel of Japanese artisanal production would still only churn out ten Mirais per day.